sport technology There is 1 product. Barometer with Altimeter precision. Analogue no battery, with support to bring you the most comfortable and easy. The barometers they carry all the add-ons of compass and thermometer. High Quality and accuracy. SILICEA ONLINE STORE has the best catalogue of barometers, altimeters, thermometers and compasses for the mountain the boat or car. Easy to carry and install at any place. All products are in stock ready for shipment. Shipping Free available. Express shipping 24h. for the whole of Spain and Portugal. 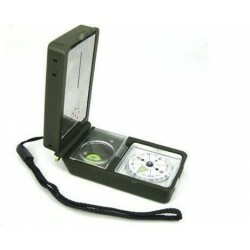 Compass With Thermometer Hygrometer LED Lighting Reflector Magnifier Spirit Level Function. Extremely sensitive with precision dial, Excellent for hiking, camping and outdoor activities, Small size, space saving, Thermometer: measure for ambient, Hygrometer: measure for ambient relative humidity.